NASA or the National Aeronautics and Space Administration is the part of the United States government that deals with space exploration and aeronautics, the operating and designing of planes. 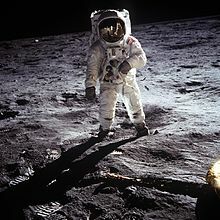 NASA has had many successful missions, including the ISS, and Apollo 11, which put the first man on the Moon in 1969. NASA was started on July 29, 1958. NASA's motto is: "For the benefit of all". The current Administrator of NASA is Jim Bridenstine since April 2018. NASA was preceded by the "National Advisory Committee for Aeronautics" (NACA). NACA was a U.S. federal agency founded on March 3, 1915 to undertake, promote, and institutionalize aeronautical research. On October 1, 1958 the agency was dissolved, and its assets and personnel transferred to the newly created National Aeronautics and Space Administration (NASA). NASA was founded to compete with the Soviet Union in the space race. In the 1950s and 1960s there was a space race between the USA and the Soviet Union - now called Russia. The Soviets started first launching Sputnik 1, the first object made by people to go into orbit, in October 1957. The Americans were worried by this. 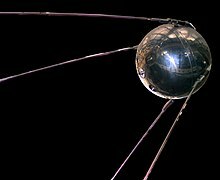 It caused a crisis known as the Sputnik Crisis as the Americans feared the Russians might start building weapons in space. This all happened at a time called the Cold War when the USA and the Soviet Union were always very close to war. Originally NASA was very small with only four laboratories and around eighty people working there. German engineers and scientists led by Wernher von Braun helped them build rockets. They had helped build the V-2 missile in Germany during World War II and the Redstone missile for the US Army afterwards. Their Army missile laboratory was transferred to NASA. In 1960 they set up the Mercury project. The Mercury Project space missions were designed by NASA, mostly to test if humans could survive in space. After they proved it was possible for people to live in space they moved on. On May 15th 1961 astronaut Alan Shepard became the first American in space. 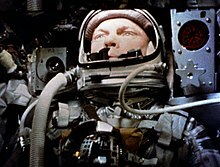 Less than a year later, John Glenn became the first American to orbit or circle the Earth. He did so in a spacecraft called Friendship 7. 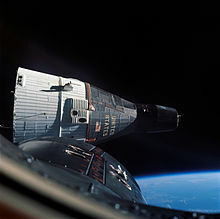 Once the Mercury Project proved that humans could live in space, the Gemini Project was started. Less than a year after it began, the Apollo Program also began. After the success of Mercury, NASA realized it had to start planning for its missions to the Moon. The Gemini spacecraft was built for two men. It was still small and cramped like the Mercury capsule, but allowed for more freedom of movement. Project Gemini proved that two spacecraft could meet and dock in space. Neil Armstrong, the first man on the Moon, was also on the first Gemini flight to dock with another spacecraft in outer space. The Gemini spaceship did not dock with another spaceship with people in it. Instead, it docked with a rocket called "Agena target vehicle". The last few Gemini missions were science experiments and spacewalks designed to prepare for the Apollo Program, which would land human beings on the Moon. The Apollo program was started by President John F Kennedy in the 1960s. The program was made of 16 missions designed to send a man to the Moon and return him safely back to Earth. The first Apollo mission, Apollo 1, ended in disaster when a fire in the command module killed all the astronauts on board. The Apollo 8 and 10 missions went to the moon. They tested equipment and took photos but did not land. The project's main success came in 1969 when Neil Armstrong and Buzz Aldrin landed on the Moon as part of Apollo 11. The mission was a big success for NASA and over six million people watched it worldwide. After Apollo 11, six more Apollo flights went to the moon. Five of them landed. The one that did not land, Apollo 13, had to abort its mission when an oxygen tank exploded in the spaceship. Apollo 17 was the last mission to land on the Moon. After Congress stopped the Moon landings, NASA needed a new direction. Using a leftover Saturn V rocket, the giant rocket that sent men to the Moon, they created a space station that orbited above the Earth. This space station was called Skylab. Skylab was very big on the inside, even bigger than a small house. Skylab was visited by Apollo spaceships. There were three missions to Skylab. Each of them carried important experiments. 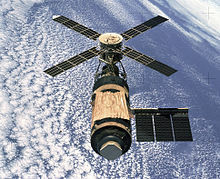 Skylab was eventually abandoned. It had served its purpose. It broke up in the atmosphere in 1979. During the Space Race, the Russians had designed their own spaceship to fly to the Moon. Their spaceship was called Soyuz. The Russians never landed on the Moon, they had too many problems. Instead, they started creating small space stations. The Soyuz spaceship is what they used to go to these space stations. America and Russia were part of the Cold War. In order to make peace between Russia and America, they decided they would dock an Apollo spaceship to a Soyuz spaceship in space. After docking, the crews performed experiments and learned about each other's cultures. 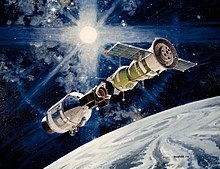 Apollo-Soyuz was the last flight of the Apollo spaceship. It has never been used since, and never will be. In the 1980s and 1990s NASA began to concentrate on building Space Shuttles. Four Shuttles were built by 1985. 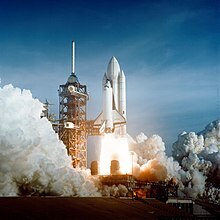 The first to launch was the space shuttle Columbia in October 1981. At this time the public began to lose interest in the space program and NASA faced budget cuts. They had planned for the space shuttles to cost less as they could be used more than once. But eventually it turned out the Space Shuttles were more expensive as building them in the first place cost more money than normal. There were further problems for NASA after the Space Shuttle Challenger disintegrated in flight in 1986, killing all seven of its astronauts. The incident is known as the Challenger Disaster. NASA also now works with the Russian Space Agency quite often.had done thei When the Space Shuttle fleet was grounded after the Columbia disaster in 2003, Russian rockets continued to take up parts to the International Space Station. The Soyuz spaceship also helped take Americans to the station. The International Space Station, along with most of NASA, lost a lot of public interest. In 2010, NASA shut down the Space Shuttle program. They were more expensive to use than other launch vehicles. Since Columbia Disaster, NASA is making an Orion spacecraft. It was launched without human on Delta IV Heavy on December 5, 2014. In June 2020, it will launch on a gigantic rocket called the Space Launch System. NASA is building this rocket as well. NASA's continuing operations include missions to the planets Mars, Saturn and Pluto. Missions to Jupiter are also planned for the near future. The New Horizons spacecraft flew past Jupiter in February 2007, studying some of the planet's moons. On July 14, 2015 the craft flew by Pluto, took high resolution pictures of the planet's surface and analysed the chemical properties of its atmosphere. NASA announced in 2004 that they plan to have a permanent Moon base by 2020. A senior NASA administrator also stated in 2007 that NASA aims "to put a man on Mars by 2037". However, in early 2010, President Barack Obama cancelled the Constellation project that was aiming to have humans return to the moon's surface by 2020. He said the project was 'behind schedule and lacking in innovation'  At the same time he cut back the amount of money NASA will be getting from the government in 2011. NASA has launched over 500 missions in its 50-year history. Over 150 missions had humans on board. Such manned missions are the most expensive and make the most news but the majority of launches are for space exploration, science, and other purposes that do not need people. NASA spacecraft such as Cassini-Huygens and the Voyager program have visited every planet in the Solar System. Four NASA spacecraft have left the Solar System, Voyager 1, Voyager 2, Pioneer 10 and Pioneer 11. As of 2013 Voyager 1 is around 18,800,000,000 (18,800 million) kilometers away from Earth. ↑ "The National Aeronautics and Space Act". NASA. 2005. Retrieved 2008-07-10. ↑ Lale Tayla, Figen Bingul (2006). "NASA stands "for the benefit of all." - Interview with NASA's Dr. Süleyman Gokoglu". The Light Millennium. Retrieved 2008-07-10. ↑ Erickson, Mark. Into the Unknown Together - The DOD, NASA, and Early Spaceflight (PDF). ISBN 1-58566-140-6. ↑ "Wernher von Braun in SS uniform". reformation.org. Retrieved 2008-07-13. ↑ "Apollo 1 - A history of NASA" (HTML). Retrieved 2008-07-14. ↑ "Publications of the Astronomical Society of Australia" (PDF). CSIRO. Retrieved 2008-07-13. ↑ "NASA Shuttle Fleet Grounded after Challenger explosion". ↑ "Hubble Deep Field - The most important image ever taken?". ↑ "BBC Mission guide: New Horizons" (HTML). BBC. Retrieved 2008-07-14. ↑ "NASA Office of Public Affairs" (PDF). NASA. Retrieved 2008-07-13. ↑ "NASA aims to put man on Mars by 2037". The Times of India. Retrieved 2008-07-16. ↑ 12.0 12.1 "Obama cancels space program". BBC News. Retrieved 2010-02-06. ↑ "Slashed NASA budget leaves the US no longer a space leader". Chron.com. ↑ Stephen Creech (April 2014). "NASA's Space Launch System: A Capability for Deep Space Exploration" (PDF). NASA. Retrieved 2019-03-07. ↑ Spaceflight, Mike Wall 2013-09-13T09:09:40Z. "Interstellar Traveler: NASA's Voyager 1 Probe On 40,000-Year Trek to Distant Star". Space.com. Retrieved 2019-03-07. Wikimedia Commons has media related to NASA. This page was last changed on 15 April 2019, at 05:10.